Contact with families and friends: With the help of mass communication many people can communicate with heirs’ families or with their friends. Actually people travel around the world and by this reason they need a good way in order to not lose the contact with their families in their native country. The studies reveal that approximately 95% of the population use electronic devices for their communication for example: Mobile phones, Telephones, Computers etc. Universality: This refers to the extensiveness or commonness of a medium and acceptability of messages. A person does not need to be literate or educate in a particular language before listening to a radio program or a watch television program in that native language. Launching business and introducing new products: Mass communications are used to make wide circulation of senses regarding forming and launching a business and introducing new products of the organization. Wide cover: The audiences of mass communication are spread over a vast or a wide geographic area in a given time. It can spread the product and business news of the organization over a large part of the country and the world. Interpretation: Interpretation is the function of mass media that provides a context for new information and commentary about its significance and meaning. Traditionally, newspapers provided such interpretation in their editorial and commentary sections, reserving news pages for supposedly neutral information. Cultural transmission or exchange: This function entails the passing on or the transfer of a nation’s (or society) social values and heritage from one generation to another. Cultural transmission function as the preservation of past heritage culture from one ethnic group to another, one nation to another and from generation to generation for the purpose of promoting and even integrating culture. Television and film have the greatest potential for socialization because they seem to be the most realistic. Entertainment: One of the most popular functions of mass communication is entertainment. Entertainment always has been part of society and higher percentage of audience prefers entertainment to information. Those in this category include students, youths, teenagers, sport lovers, kids (cartoons). Through sound recordings, film, radio and television, entertainers have been able to attract audiences around the globe. International Trade: Mass communication is only the tool for creating foreign market of a product. In a market economy, mass communication reaches the product message across the world and creates a market. Increasing business goodwill and image: Mass communication helps to increase business goodwill and image the country and the world. It communicates with the people about mission, social activities, educational promotion etc. Which create a favorable organizational image. 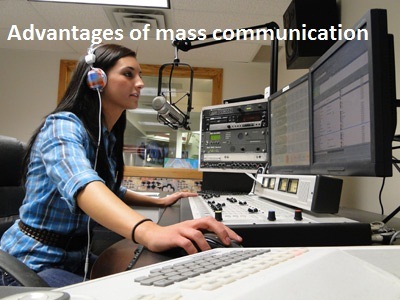 Advertising product and services: Mass communication plays an important role in advertising product and services. Mass media like radio, television, newspaper and internet are the main vehicles of advertisement. Interdepartmental coordination: Generally, large organizations have various departments like procurement, production, marketing, administration, human resource; accounts etc. Through the help of mass communication, managers of this department cooperate and coordinate each other. Inform market price, demand and supply: Mass communication helps to inform market price, demand and supply of product and services for home and abroad.